In an election-driven, workplace-organizing campaign, going public is a key step. The workers or union try to organize under the boss’s radar for as long as possible, so that they can avoid retaliation and union-busting before they accumulate strength in numbers. Eventually, however, they have to legally file or “petition” for an election, at which point the workers notify the employer of their campaign. The goal of these types of organizing drives is formal recognition from the employer, which in theory compels the employer to sit down with the union and negotiate a contract. In the IWW, our main model of organizing is the “solidarity union.” A solidarity union consists of a group of workers taking direct action in a workplace to get what they need and want, without regard to formal recognition by the bosses. Instead of relying on legal processes, workers use the power they have at any given moment, seeing as their hands are on the levers of production—and therefore on the boss’s profits. Examples of using that power include work slowdowns or stoppages, refusing certain kinds of unsafe work, confronting the boss with problems as a group, and even strikes. What is the significance of “going public” in a solidarity unionism campaign? If workers are not seeking legal recognition through an election, what purpose does going public serve? Does it need to happen at all? In this article, we reconsider the pros and cons of going public in the context of the IWW’s distinct and powerful alternative to business union organizing. Does going public heighten the risk of retaliation? In the Ellen’s Stardust Diner campaign in NYC, IWW restaurant workers went public in the form of a major story in The New York Times. The reporter contacted the owner for comment, and this was the first he had learned of the union. He said he was shocked that people were unhappy, and that he would gladly sit down with them. This turned out to be a lie. Even though the union had gathered the support of virtually all of the servers, the owner refused to meet with them about their demands. 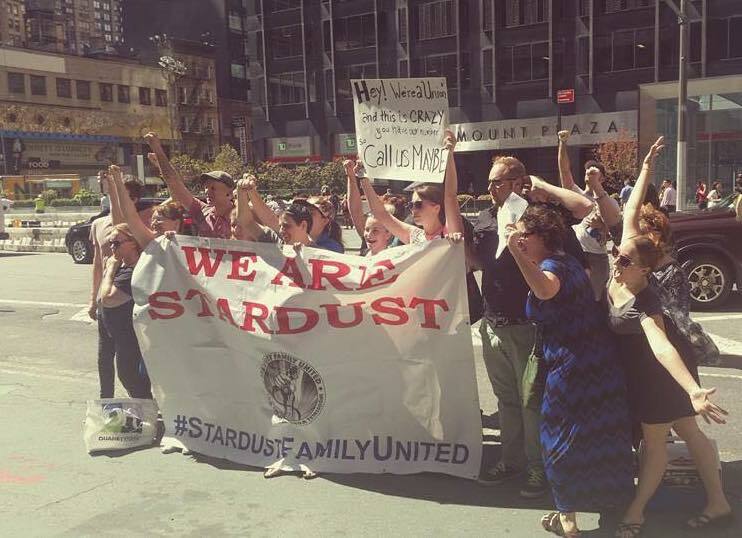 In response, union members held a large demonstration outside of the restaurant, displaying a bright, new banner with their name and logo—Stardust Family United—while singing and chanting noisily, to place public and emotional pressure on the boss to bargain. Two weeks later, every person at that demonstration was illegally fired. Sometimes, bosses react in the strongest possible way to finding out that a union is forming in their business: by attempting to eliminate union supporters through firings. This is something we know in the IWW, which is why we cover it at length in our organizer trainings. Stardusters had gone public because they felt it was the next logical step in their organizing. They had already gathered nearly unanimous support among servers, they were meeting regularly, and had learned to act as a group. Now it was time to simply tell the boss point-blank that they were a union, and that they had demands. In a way, they were following the steps of a recognition campaign, just without the NLRB election. They believed the owner would see their strength and negotiate. But the union’s coming-out party didn’t have that result. Instead, the owner started firing people for union activity and hired a union-busting lawyer. An IWW campaign in Chicago offers an interesting contrast. At Arrow Messenger, the union of messengers did not go public as a “union” – they did not use “the u-word” – but simply approached the boss with specific demands, initiating direct bargaining sessions between the bosses and the workers. When bargaining did not yield the results they wanted, a quickie strike and a series of prolonged direct actions won them most of their demands, including a commission raise for over one hundred couriers. The avoidance of word “union” may have made it easier for the bosses to give concessions to the workers, but it did not prevent retaliatory firings in the long run, and the active committee of about 20 workers was picked off one by one. So it’s clear that workers can also be fired in an active campaign that isn’t “public” in the traditional sense. If you’re effective, you’re going to end up with a target on your back, one way or another. Fortunately, at Stardust as well, despite not one but two rounds of mass firings, workers were able to win on a majority of their demands, by using direct action in the workplace. The owner never sat down with them, but by taking on issues one by one, and coordinating work refusals and other tactics, the workers made multiple gains, including refusing unpaid work, fixing unsafe equipment, and generally improved working conditions. Going public, in retrospect, was not a necessary step for that. Does going public throw the boss off the scent? Bosses are used to traditional recognition-focused union drives, and so are the professional union-busting lawyers and consultants they hire. The bosses’ and union-busters’ “playbook” usually does not account for a solidarity union strategy. This means that they come out swinging and missing. “The union will make you pay dues!” Dues are voluntary in the IWW. “The union will ask you to sign an authorization card!” Solidarity unions don’t ask workers to sign auth cards. “The union will bargain away your rights!” The union is just the workers in the shop, making decisions about what they want—not a bureaucracy that makes decisions behind closed doors. This kind of played-out union-busting script makes the company look incompetent and occasionally ridiculous, because they seem not to understand the union effort. For example, at Whole Foods in Philadelphia, while management focused on fending off an authorization card campaign, the IWW won scheduling rights in multiple departments, pay equity, and better safety equipment – and massively shifted the balance of power on the shop floor. Until the capitalist class wises up to solidarity unionism, we will continue to have this advantage. Going public could be a tactical way to send the boss on a wild goose chase while we are building elsewhere. Then again, while some of the union-busting messaging may be off the mark, bosses and union-busters still know how to intimidate and harass workers to discourage them from organizing. They don’t just hold captive meetings and distribute anti-union propaganda: they fire, they threaten, they bribe, they mess with people’s schedules, they play nice, they divide and conquer, etc. All in all, union-busting is something we want to minimize where we can, not something we want to invite. Is going public necessary to win? Two veterans of the Stardust campaign, who had been fired and went on to take other jobs, took collective action in their workplaces and won. One was working at a hip burger chain restaurant. The chain had recently come under new management, and the new managers tried to force all the staff to sign a harsh new discipline policy. The Stardust vet led a collective refusal, and management backed off. The other Stardust vet was working at a fancy restaurant on the Upper East Side. She and her coworkers noticed that they weren’t being given all of their tips when guests paid by credit card. She led a march on the boss with her fellow servers, and the situation was rectified immediately. These actions delivered swift justice, and neither resulted in any kind of retaliation. Workers can accomplish more than some expect without the boss even realizing that what they are doing is union activity. For that matter, at Stardust, workers engaged in a march on the boss that won their “tip bucket” back before ever going public. That action didn’t trigger union-busting. Only the New York Times article and banner demo did. Because as we argued in the last section, bosses rarely recognize solidarity unionism for what it is. On the other hand, some campaigns literally cannot grow beyond a certain point without going public. Consider the Starbucks Workers Union organizing campaign. Without publishing a website declaring the official existence of the IWW Starbucks Workers Union, the campaign could have remained isolated to the initial New York store. Going public in a big way allowed the campaign to expand nationally, and it produced a cascade of new organizing leads across the country, in addition to more broadly raising the profile of the IWW. There are special challenges to organizing a large target, whether one very large worksite, or a chain or franchise with multiple work sites. Underground communication across vast physical distance is difficult. Sometimes going public may be the less-than-ideal yet necessary road to reach out. Can a solidarity union build a collective identity without going public? Some might wonder whether it is necessary to go public to solidify the idea of the union in workers’ own minds. Also, going public can provide a psychological boost for workers engaged in organizing. It’s a chance to openly express pride; to feel part of something bigger, with a name and a public face; to explicitly contribute to building and redefining the bigger union movement; to adamantly defy the bosses toe-to-toe; and to feel the relief of not having to work in hiding anymore. While each one of these things is an element of strategically non-public, underground campaigns, it’s going to be somewhat restrained without workers being able to hoist the flag and say, “We are the union!” Going public provides catharsis for an organizing committee, as well as a rocket boost to organizing energy. Having said that, that boost can be devastatingly temporary, when workplace polarization hits and the boss’s anti-union onslaught begins in force. Too many of our campaigns rely too heavily on the adrenaline rush of going public. Worse still, some organizers believe going public is the move that will save the campaign. In examples like the national Starbucks organizing, as well as at Jimmy Johns, workers in new shops would often go public way before they were ready. Organizers were motivated by a desire to catch the momentum of the high profile campaign, to save a committee from flagging interest, or to give over to the perceived need to “do something.” This last ditch style going public was a recurring recipe for burning out brightly, but losing nonetheless. There’s also an interesting phenomenon that takes place in a solidarity unionism campaign, where union membership is voluntary. At both Stardust and Arrow, there were moments when workers engaged in really militant action without considering that to be union activity. A worker would say they weren’t interested in joining the union, but they would engage in a work refusal or stoppage because they cared about the issue being fought over, and they wouldn’t even make the connection between the two things. Later on, union committee members would help them draw lessons from their experiences to make that leap. If a campaign eschews going public, organizers can still generate that feeling of being part of something concrete and special. It falls to the committee to keep impressing upon coworkers that they are the union and the union is them: that the demands they win on the job are what the union is and does—nothing more, nothing less. Solidarity unionism is unionism. Is it worth going public for the legal protections? Sometimes workers feel that they will have more legal protections if they go public. After all, as of this writing, it is illegal to fire a worker for organizing in the U.S. But as Wobblies, we know that just because something is illegal doesn’t mean a boss won’t do it. Bosses engage in wage theft and safety violations all the time as well. As we’ve seen, going public can actually drive firings instead of preventing them. The boss hears the union-buster’s cost/benefit analysis of firing away the union, and the price is often deemed worth it. Stardust workers themselves still debate whether it was the right idea to go public. One of the arguments in favor is that being public allowed them to file ULPs (Unfair Labor Practices) asserting that they were fired for organizing. This line of reasoning is a little bit circular: You go public, causing you to get fired, so you can claim a ULP when you get fired. To be a bit more fair, the idea is that the boss may retaliate against you whether you are public or not, but at least if you are public, you can make your case to the National Labor Relations Board (NLRB) that you were fired for organizing. And it is true that board agents—like bosses and union busters—have trouble comprehending solidarity unionism campaigns. If a solidarity unionism campaign is public, it’s more likely that NLRB bureaucrats will be able to fit the case into their narrow vision of what a union organizing campaign is, and treat firings as illegal. One final thing about going public and the law: At Stardust, the owner tried to call what he believed was the union’s bluff and force an election. Maybe he didn’t realize the union had majority support. Maybe he thought he could draw the bargaining unit big enough that they would lose the vote. At any rate, because workers weren’t interested in a recognition campaign, they simply quashed the election legally, with the help of their very talented labor lawyer. But note, this is yet another reason why you might not want to go public, especially if you are a minority campaign, which many IWW campaigns are. An election may be forced on you, which you may lose, and that may demoralize the organizing committee and deflate organizing efforts. The value of “Going Public” should be considered contextually. Smart organizers don’t go public as a matter of course, as if it’s the next box to check on a list. We’ve attempted here to question the orthodoxy that going public is a necessary stage to every campaign and something you must inevitably build towards. As we say in the 101 training, the question to always ask is, “Given where we are at right now, can we advance the campaign without going public?” Until the answer is a definite “no,” don’t do it. However, we’ve also tried to question what it means to go public. Any campaign that goes after major gains—whether pay increases, health care, improved working conditions, or even just more control on the job—will eventually find itself in an overt confrontation with the boss. There is no getting around that conflict. But that does not require throwing the “u-word” in the boss’s face. We in the IWW openly aim to win workers away from the dead end of business unionism. That goal has always been as public as can be. And we all want to see the day where solidarity unionism is a powerful force. But as things stand today, when we consider the value of public IWW branding from the shop level perspective, there are just too many deficits to ignore in favor of always having a big “coming out” party in our campaigns. Here’s something else worth thinking about. Even business union, recognition-based campaigns delay going public for as long as possible, and they eventually go public because they have to—because they’re petitioning for an election. In the case of a solidarity union campaign, simply telling the boss you are a union doesn’t usually improve your power with respect to him or her. You may get a moment of intimidation out of it... or you may just face an onslaught of retaliation. Sometimes using the u-word with a boss just signals them to hire a union-buster, not to come to the table. Either way, your ability to prevail will depend on the extent to which you can mobilize to take action in solidarity with your coworkers. This isn’t to say that there is no value, or no meaning, in going public in a solidarity unionism campaign. We just have to think carefully, and be ruthlessly honest, about what that value really is.